Sure, you could dress up in full camo, pad your body in all the vulnerable places and crawl around in muggy, midsummer heat. Or, you could sit in A/C while pwning all those suckers. 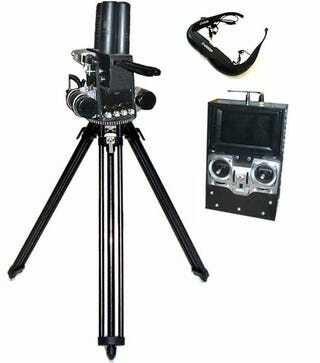 This wireless EMT Paintball Sentry Turret allows you to do just that, as long as you're within range of its A/V feed. An aluminum tripod base packed with rechargeable batteries supports a gun backed by two CO2 tanks and a 400 round hopper. Streaming 2.4Ghz video to a remote rigged with a display, players can see the battlefield in real time and tilt/pan/shoot accordingly. But you'd never pay its $1959.99 asking price, right? You'd pay way more to upgrade with some of these enticing options.